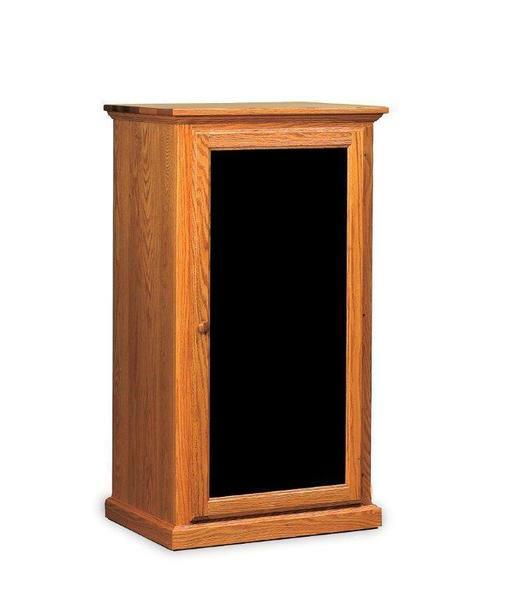 Shaker style furniture presents a simple beauty that is full of function. This Amish Shaker Stereo Cabinet with Four Adjustable Shelves adds a practical, durable and beautiful solid wood storage cabinet to your home furniture collection. This solid wood stereo cabinet blends in well in your bedroom, living room, family room or office. Keep the music collection you love organized inside this stunning cabinet. The smoked glass of this shaker cabinet adds a dramatic effect to the gorgeous shaker style. Choose from nine premium solid hardwoods to handcraft this handy cabinet. Select a solid wood door or glass door for your design. View more of our lovely shaker furniture collection for other areas of your home. Call us today with any questions about our Amish furniture or visit our brick and mortar store to experience Amish furniture in Sarasota, Florida. Our toll-free number is 866-272-6773. Shown in Oak with Light Walnut.